Tragedy can strike in the most seemingly harmless ways. Take heating pads, for instance. They’ve been around for more than 100 years, but every year people suffer severe burns and even death as the result of damaged or misused heating pads. Frayed electrical cords can ignite a fire in an instant, with flames spreading rapidly because of the highly flammable materials often in close proximity to a heating pad, such as blankets and mattresses. As high as the statistics are, however, it is often difficult to get an insurance settlement or even a lawsuit against heating pad manufacturers without legal help. Heating pad fires don’t just occur at home; they also occur in hospitals and nursing homes. The Consumer Product Safety Commission (CPSC) releases an annual report on heating pads to emphasize the potential hazards of this everyday household item. Shock – As with any electric device, an electric shock can occur when plugging in or unplugging the cord as well as when there is exposure to damaged electrical wires. Burns – More than 1,600 heating pad burns are treated in the emergency room every year. Although most are direct thermal burns from improper use, some are burns that have resulted from a heating pad fire. 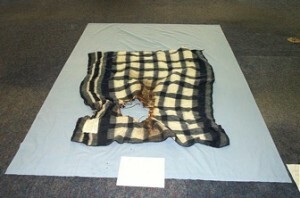 Fires – The CPSC reports approximately eight deaths each year as the direct result of heating pad fires. If the wiring in the heating pad malfunctions or creates a spark that ignites the pad, a fire can get out of hand very quickly. One reason insurance companies and manufactures are reluctant to reimburse claims is that in most cases, simple preventive measures would have kept a heating pad fire from starting in the first place. Inspect Carefully – A heating pad should be carefully inspected before each use and unplugged after each use. Crimped wires and frayed cords can send electrical sparks that ignite the padding, even if the heating pad is on a low setting and sometimes even when the pad is turned off. Use Properly – Every heating pad comes with an instruction manual that should be read and followed. Simple things like keeping the removable cover on during use, not bending the pad over on itself, and using the pad on top of the area to be treated instead of under are all basic safety measures when it comes to using a heating pad properly. Replace Regularly – Heating pads, if used on a fairly frequent basis, will wear quickly and should be replaced at regular intervals, especially if there are obvious signs of wear, such as frayed cords or burn marks in the padding. Still, there have been many recalls of heating pads over the years due to their propensity to ignite a fire. If you are the victim of a heating pad fire or injury, it is important to get help. Seek Advice – Heating pad manufacturers have teams of lawyers that can forcefully argue for negligence on the part of the user when it comes to lawsuits. That is why it is important to get an injury attorney skilled in these types of cases. Collect Evidence – A case is always strongest when there is tangible evidence. Receipts, recall notification letters, pictures of damages, and timeline of events can help an injury attorney build your case. Pursue Settlement – With good legal counsel, you can receive a proper settlement for your damages. Just contact the Warshauer-McLaughlin Law Group, P.C at (720) 420-9800 and let them argue your case.